I’m so pleased to be on the blog tour for My Mother’s Shadow by Nikola Scott which is published today in paperback. Happy publication day, Nikola! It’s a book I have had for a while and really wanted to get around to reading so I’m really glad to be able to share my review with you today. And I’m also spoiling you with a guest post from Nikola as well, all about working from home. 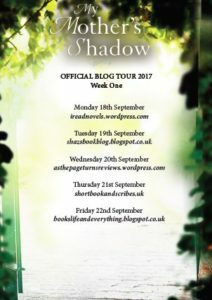 Huge thanks to Becky Hunter from Headline for the place on the blog tour. I used to love working in an office. The routine of the working year, the predictability of meetings and leaving do’s. Colleagues, who were only ever a door away to chat, give feedback, dole out sympathy or slope off for a sneaky coffee when the going got tough. Imagine my gaping shock , ahem, surprise when I suddenly found myself sitting at my desk, all alone at home. No sound of incessant telephone ringing, no mates giving a cheerful wave across the open-space office, no one to talk to once the school run was done. I had left the workforce rather reluctantly when my husband was seconded abroad, the only silver lining being that I would now finally have the time to develop some of the writing ideas I’d been toying with for a while. That silver lining had to sustain me for a good long time, because even well into what would eventually become My Mother’s Shadow, part of me was still mourning that busy, bustly, noisy office life I’d left behind: the sense of belonging; of having a place to go with a clear purpose every morning; of life being divided between working vs non-working time; of external validation. Truth is, being a writer can be a rather solitary business and taking that leap can take a while to adjust to. At first, the hours blend into each other until you seem to be working all the time and yet never really get down to the nitty-gritty. You don’t have the faintest idea of whether your project is going the way it should or if you’re lagging behind the curve, the only way-marker your own straggling discipline. Days go by without talking to a sane adult, especially when you’ve just moved to a new country, and you have to forcefully restrain yourself from pouncing on the postwoman for a prolonged chat about whether people are more likely to topple off cliffs or be poisoned by well-water. Or, you know, the weather. Thankfully, adapting is what we humans are particularly good at, and the upsides of writing from home are as manifold and brilliant as being part of an office. Complete and utter flexibility, wonderful if you’re juggling family life and writing. Working wherever you want. Staying in your PJs all day. Dictating your own schedule. Over time, I’ve grown to love that freedom. I’ve found my routine (fresh mornings are best for writing and tired afternoons for research); I know how to shoehorn my discipline (clear short-term goals and no distractions); I’ve learned to resolutely separate both my lives and to be ‘done for the day’ when the day is done. I schedule meet-ups with friends as consciously as I schedule my writing time. I belong to a book club. I play with my boys and I bake cakes a lot. Only occasionally do I still yearn for smart clothes and office life, but then I turn up the radio, find myself another sneaky piece of cake and curl up with my computer on the sofa to count my blessings. Thanks for so much for that lovely post, Nikola. I can imagine how much discipline it must take to work from home with all the distractions that come with it. My Mother’s Shadow is recommended for readers who also enjoy Kate Morton, which is me. I’m pleased to report that I agree with this and Nikola Scott is now an author whose future books I will look forward to reading. This book is a dual time narrative story. The majority of it is made up of Addie telling us about the year that has passed since her mother’s death. They had a sometimes difficult relationship that Addie has never been able to understand the reason for, especially as her mother and her younger sister, Venetia, got along famously. So you can imagine that a long lost sister turning up out of the blue was a bit of a shock! The other part of the story is Addie’s mother, Elizabeth’s, diary entries from decades earlier in the late 1950s which nicely fill in the blanks in Addie’s first person narrative. It’s a charming and beautifully written story. Not one to be rushed but one to take your time with and take in all the details of the cleverly woven tale. I loved following Addie on her journey of discovery, finding out more about her mother’s life and in turn examining her own hopes for the future. It’s my favourite kind of book I think, where two different times collide and where secrets are uncovered. There are lots of surprises and mysteries and I couldn’t always work them out which was nice. It’s an evocative account of coming of age in post-austerity Britain and of the consequences that actions can have many years down the line. 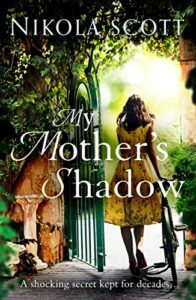 I found My Mother’s Shadow to be hugely pleasurable to read and a little bit heartbreaking. I’ll definitely be looking out for Nikola Scott’s next book. With thanks to the publishers and Amazon Vine for the review copy. My Mother’s Shadow is available now in ebook and paperback. There are some other fabulous blogs taking part in the tour so please do go and have a look. Nikola Scott was born and raised in Germany and studied at university there. Having been obsessed with books from a young age, Nikola moved to New York City after her Master’s degree to begin her first job in book publishing – a career in which she could fully indulge her love of fiction. 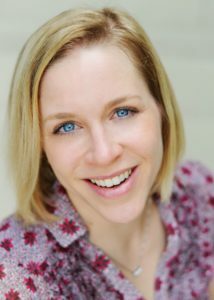 She spent ten years working in publishing in New York and then in London, editing other people’s books, before she decided to take the leap into becoming a full-time writer herself. She now lives in Germany with her husband. MY MOTHER’S SHADOW is her debut novel. Sounds like my kind of book and really enjoyed the guest post too. Thanks, Joanne. I think you would like this one. Lovely review! Sounds like I need to add this to my list. I love that cover too! Thank you! I hope you enjoy it if you read it.